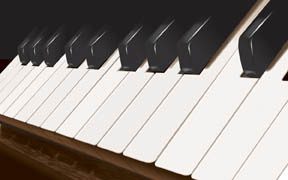 Voicing is Tuning or Regulating the Tone of a piano. Adjustment of the hardness and consistency of the hammers will achieve a smooth transition of tone throughout the compass or range of the piano. Voicing will also enhance tonal variations and shading between soft and loud playing. This will allow the pianist to achieve greater impact when using dynamics to create mood and emotion. Voicing can also be done to change the tonal character of the piano to suit personal taste or room acoustics. As hammers wear down with playing, grooves develop where the strings contact the hammer felt. This compresses the felt. The striking surface of the hammer gradually becomes flatter and the tone created becomes more brittle and astringent. The remaining felt outside the string grooves kills the tone as the hammer bounces away from the string after the initial blow. These effects may occur so gradually over time that they may not be initially noticed, but sooner or later it will be apparent that the tone has changed for the worse. Hammer shaping will remove the grooves and return the hammers to their original rounded "egg shape". Regular light hammer shaping with every service visit will prevent grooves from ever causing significant degradation of tone. Please call (847) 312-9057 or e-mail pianotuning@sbcglobal.net if you have questions, or to make an appointment Monday through Friday. Weekend appointments are also available.